I decided this week I needed another gym top and shorts... I can't keep up with having clean gym clothes in this hot weather. I also thought it might be good to have a gym shirt more covered in the shoulders as the weather starts cooling off. So I decided to try a pattern a few have recommended on Pattern Review - Lekala 4273 - Sports Vest . I put in my measurements and received my pattern and I have to say I am impressed with the fit. 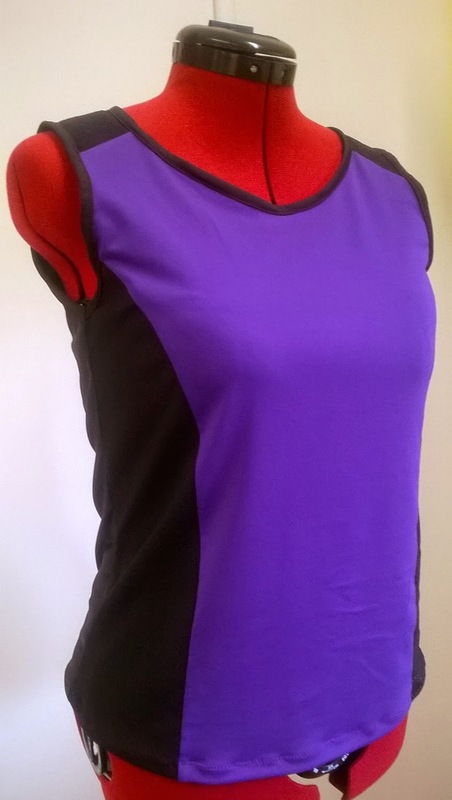 I used supplex for the purple panel, sports mesh for the shoulder yokes and side panels and tactel nylon lycra for the back. I got the mesh and the tactel from Joelles ebay store. I saw mesh used like this on a friend's top at the gym through the week and thought it would work well and (hopefully) look RTW. 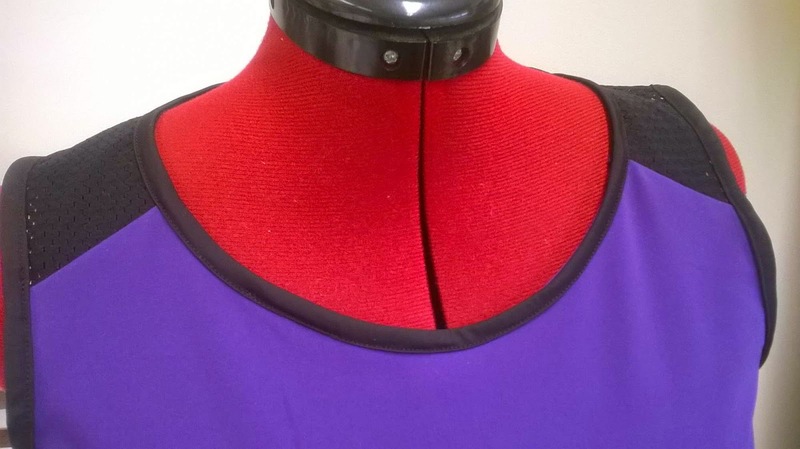 Shown large so you can you see the mesh in the shoulder yoke panels. The only alteration was to lengthen the top by 1cm. I would lengthen it a bit more next time I make it and perhaps curve the hem to make it look a bit more current like Blooms has done on some of her gym tops. I thought about making the armhole deeper as I am used to them that way on my gym tops but tried it as it was and found it wasn't uncomfortable. 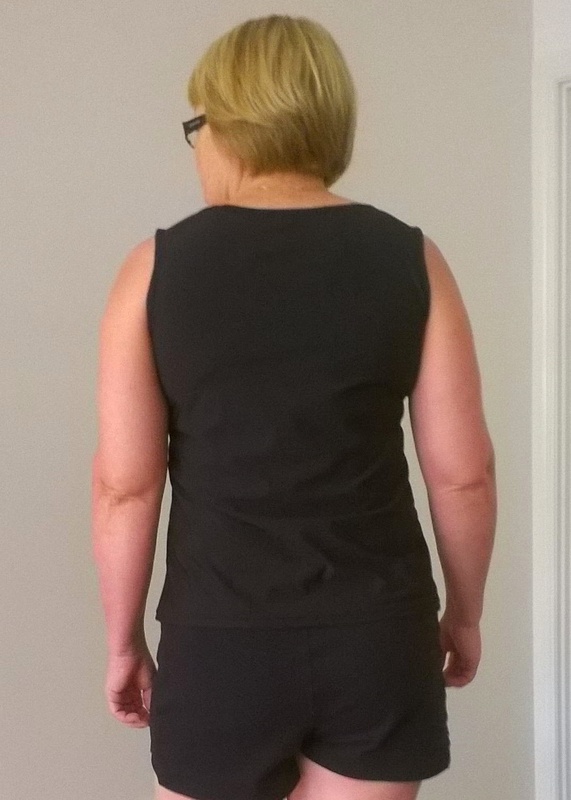 I was very impressed with the fit, particularly around my shoulders and upper back. Giving the bust and under bust measurement must make this a better fit I think. I also made another pair of shorts. My gym of choice is a crossfit box and I have been going for half a year now. The pics above show my new top paired with my Jalie shorts which I love, but they are made of supplex and I find they are pilling on the bottom as the floor is quite rough on them. So I decided to try a fabric with a harder finish and found this black fabric which is a nylon lycra blend but called Tactel. It seems tougher... it was hard to get a pin through the fabric and I think it blunted my sewing machine needle going by the skipped stitches in my next garment. So I shall see how it wears. I decided to use the opportunity to trial a new pattern - the Papercut Anima Pants. I was pretty happy with how the pattern went together. I made them as per the pattern. The only changes I might make next time is leave off the faux fly (to make the front crotch easier to adjust) and to maybe add some width to the inner thigh area. Overall I like this pattern and want to make the long version for comfy pants. 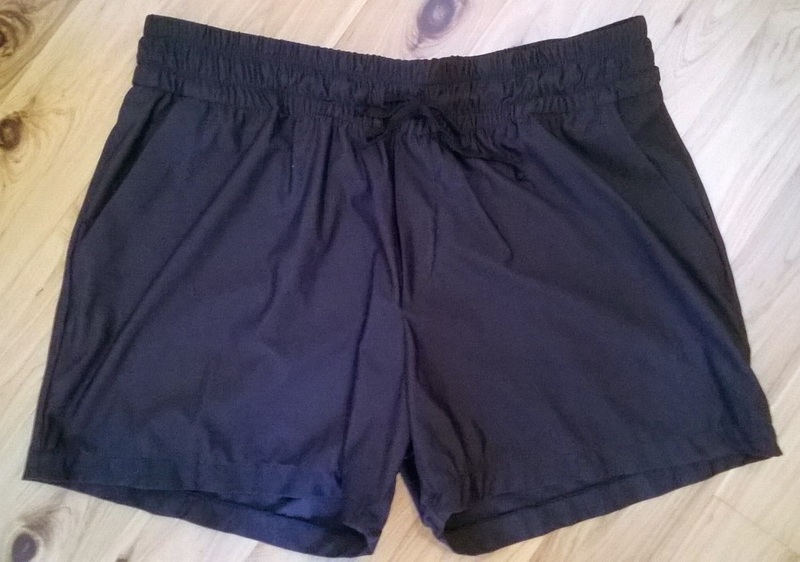 The photo is the shorts flat. I don't think this fabric photographs well so probably won't be bothering to get a photo on me, but I will be using these a lot for gym and am interested to see how they wear. Another great set of gym wear and so glad the Lekala top worked out so well. Please keep us updated on how the tactel wears! 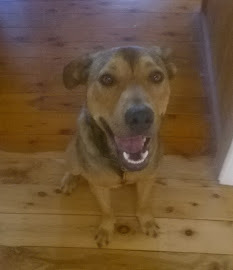 I've just gone to the ebay shop you linked and I might be there awhile, lol, thanks for the great tip! 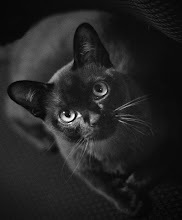 I may need to join you on that intervention! This looks like a great top pattern to try. Great gym gear - I'm a fan of the anima pants pattern. 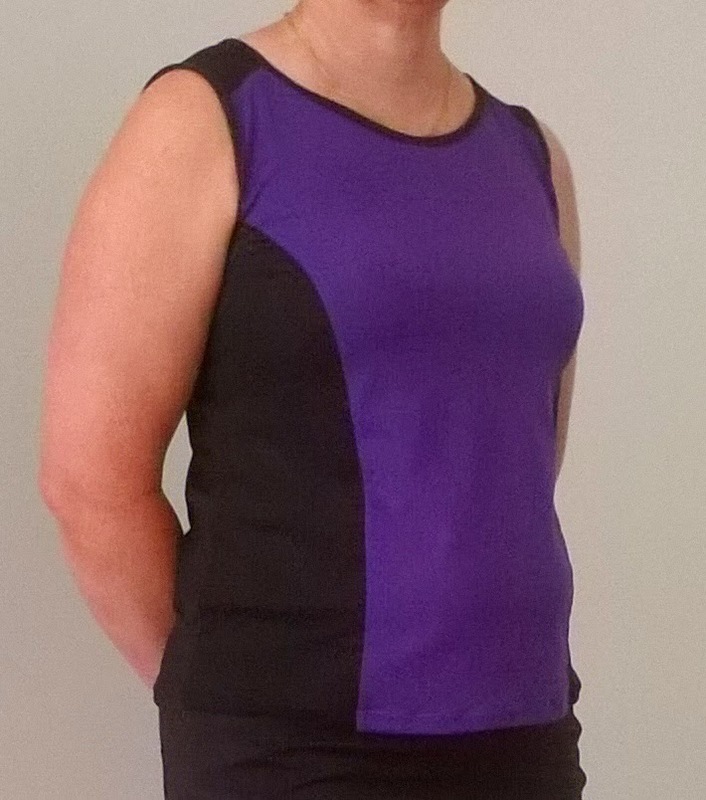 Great gym wear Sue and the Lekala top is a great fit. Also, thanks for the link to the eBay shop and being Australian, I will look there when I want to try some more gym wear. You have the best gym clothes! These look great. I have yet to try the Lekala patterns ... I love seeing the reviews for them. Your new gym clothes look great and those anima shorts look to be a very versatile design...I could make that style for my everyday clothes. Fantastic gym outfit. I like how you've combined the different fabrics. No intervention required...as long as you keep showing us what you have made 😃 Glad you are back at the gym, Sue, and all the gym clothes you have made look great! I agree the fit of this top looks really good on you.